DEMOGRAPHICS. The Russian demographic problem – which, incidentally, has its roots in the Soviet days and is mirrored in most FSU countries (Latvia perhaps the worst) – was the consequence of problems at each end. Low birth-rates and high infant mortality combined with too many early (and largely preventable) deaths. But, contrary to the customary poorly-sourced pieces that the Western MSM is rife with, progress is being made. Anatoly Karlin has been posting on the subject for several years and is well worth reading. His latest argues that Russia’s population has actually increased and is today higher than it was in 2009. While the natural population increase is still negative – but less and less so every year – the increase has come from immigration. Improvements have been made at both ends of the problem but Karlin provides data showing that deaths by alcohol, suicide and homicide have seen great reductions. They are still rather higher than they should be but these are factors where comparatively easy resolutions can be found. In short, it appears, barring some new disaster, that the Russian demographic crisis is on the way to being solved; that the various government programs are having their effect and that increasing prosperity will continue to raise life expectancy and reduce infant mortality. Thus Russia’s “demographic crisis” is yesterday’s news and the improvements – with more expected – serve as another of the many reasons that Russians generally approve of the Putin team. It cannot be said too often that the reasons for the Team’s popularity, trust and support in Russia is not that opinion polls are fixed, or that the mass media is as it was in the Soviet days or that Russians are naturally subservient (all assumptions of the Russophobic tendency) but because Russians can see every day the effect of a governing team that, generally speaking, does what a government is hired to do. WTO. The long dreary saga of Russia’s attempt to join the WTO drags on. Although a member of the G8, firmly in the top 15 economies of the world and an important trader, being on the waiting list for years, promises of support from Washington and others, Russia has still not joined Zimbabwe, Papua New Guinea, Mongolia, Guinea-Bissau and 149 other countries in the group. On Friday Foreign Minister Lavrov said all the terms had been completed. All but one that is: the tradition is that all members must agree and Georgia, a member since 2000 – a gift to Shevardnadze I believe – does not. The latest from Tbilisi is that an official calls for Moscow’s agreement to “jointly monitor the Russian-Georgian border with international observers”. US Congressmen are getting into the act. Russians can be forgiven for seeing all this as another door being slammed in their faces; always a new goalpost, further down the field. We shall see – there is some indication that the EU is tired of Georgia’s intransigence. LUZHKOV. Confirming what many suspected, the head of the Presidential Administration has said that the reason for firing Luzhkov as Mayor of Moscow was not just his “extremely inefficient city management” but also “the horrible level of corruption.” Luzhkov has threatened to sue. Medvedev has just ordered a probe into the 2003 sale of land in Moscow. The land had been set aside to house foreign embassies but was sold to a company belonging to Luzhkov’s wife. POLITKOVSKAYA. Another former policeman has been charged with organising her murder. PATRIOTIC WAR. It’s autumn and time for 1812 war re-enactments. Getting bigger each year. GAS WARS. Ukraine has given up the idea of contesting at the Stockholm Court of Arbitration the 2009 gas price deal negotiated by then-PM Tymoshenko. Kiev still hopes to get a lower price by negotiations and PM Azarov is optimistic. Ukraine has extensive shale gas deposits and has recently signed exploration contracts with Shell and ExxonMobil and is hopeful of freeing itself from dependency on Russian supplies. THE PROGRAM, MEDVEDEV. On Saturday Medvedev laid out some of his program in an interview. He began by declaring that he and Putin were a team “That is especially true since we have very close political approaches, we are allies and in everyday life we are close friends”. His prevailing theme is: “our country really needs modern development and gradual but steady reforms.” Once again we see the caution that predominates in their attitude; understandably I believe. He is currently pushing the idea of what he calls “extended government”. I’m not quite sure what he means by that but make a guess from things he said. He referred several times to an incident one of his questioners brought up – the improvement of local tram service that had come about only after his direct intervention – and emphasised that that was a serious defect in the way government worked in Russia: “Everything gets done this way here, it seems. It doesn’t matter who is president; you just have to make your voice heard at the very top, and then things will start to move. But we need to change this kind of decision-making system”. When we add to that his repeated references to the importance of the New Media in enabling two-way communication between government and people (“[In Russia] historically the authorities have been far removed from the people”) I assume that his “extended government” idea involves much more feedback (another word he used a lot). But we will see if the idea is fleshed out. So, his message is that it’s the same Team with the same Program. But slow but steady is the word. THE PROGRAM, PUTIN. Putin’s similar interview was on Monday. Confirming my suspicion that caution is the ruling passion of The Team, he reminded his listeners of just how bad things were in the 1990s and said: “When the country faces hard times and is steering itself out of crisis, political stability is essential.” And “We survived a very difficult period in the 1990s. Only in the 2000s did we begin to rise up and establish internal peace.” Will Medvedev’s initiatives continue? “We are on the same page on strategic matters” and, later. “I want you to understand that we are doing this together”. He re-stated the larger aim, unchanged from many previous speeches: “Our main task is to ensure this country’s development and to improve people’s living standards” and enumerated the tasks as: “a stable political situation at home” with “an efficient and growing economy” “a fully secured defence capability” (a passage, by the way, that will be taken out of context; read it: just over half way down the page, answering Kulistikov). And he reiterated a favourite Medvedev theme that the economy is far too dependent on energy exports and must be diversified. Altogether quite complementary to Medvedev’s interview and, again, the emphasis that they are in agreement on the big issues. THE DECISION. The two interviews shed a little more light on the decision to switch places. It now appears that the switch was more conditional than first we heard. Medvedev intimated, as he has done a couple of times, that the fact that Putin’s popularity was higher was the decider. Putin intimated that Medvedev had set his style and strategic program and that as PM he can put it into effect. And through both interviews run the themes “stability” and “caution” and “cooperation”. The other great theme was that the job was not finished: improvements to be sure, but not there yet and a deep conviction that it could all fall apart yet. CHECHNYA. Kadyrov announced that a commission of clergy and elders had, over the past year, resolved all blood feuds. If true, this is a substantial achievement. To my mind the shock and disappointment was not that Putin would run for President but Medvedev’s admission that such had always been the plan. Was Medvedev ever truly President? Or was he only a seat-warmer? At the least Putin and Medvedev could have run against each other giving Russians a more serious choice than they have had between the Establishment choice and Zyuganov/Zhirinovskiy. But instead we have this hole-in-the-corner decision that makes a mockery of Medvedev’s oath of office. Will any President of Russia be taken seriously by anyone while Putin lives? The next shock is the damage Putin has done to his own cause. Remember his famous statement that Russia should be a “dictatorship of the law”? I read this at the time to be an intention to build a rule-of-law state. Or at least a rule-of-rules state: clear rules for all to understand and clear and fair punishment for those who break them. But hasn’t he just shown that while there may be a written set of rules, they aren’t the real rules? His return shows that not even he believes that the political structure he erected on the ruins of the Soviet period and the 1990s can work without his hand on the tiller. To say nothing of making Russia look like another President-for-Life-istan; I thought Putin was more patriotic. It’s almost an admission of failure. I know that many Russians welcome the decision and that some argue that, in possibly difficult times coming, both in Russia and outside Russia, it is better that Putin’s proven hand be at the tiller. Others argue that this will allow a new and more effective stab at the modernisation that Russia needs. Maybe. History does show a very few examples of leaders who never lost their creativity and authority and it seems that Putin thinks he’s one of them. But most Presidents-for-Life are a drag on their country: eventually they clog up with sycophants and complacency. He will be elected, there’s little doubt of that. And it will be a popular choice requiring no fixing by the Kremlin. He is still extremely popular and for good reason. There will be no rioting in the streets and only protests from the people who protest anyway. Stories of mass emigration are fantasies. But what about six years later? Or twelve? And the outside world will do business with him – some even relieved that they know who the real boss is. But the anti-Russia crowd, already weirdly obsessed with Putin, will be given a fresh wind and will go on shouting that Russia is just a dictatorship: always was and always will be. Will we see more NATO expansion? More “coloured” “revolutions”? More hysteria over the “energy weapon”? Missiles in the neighbourhood? Putin could truly have been the George Washington of his country. Establishing it, settling it, guiding it and then setting the precedent that two terms are enough for any mortal. That would have been a true service to a country that has seen too much one-man rule. His successors, like Washington’s, would have respected the example for decades. Instead we have the rule that the Vozhd is the Vozhd until death carries him off. It’s a disappointing and shabby decision. ON AND ON. THE REACTION. I’ve been reading a lot of reactions and I believe they can be summarised as follows. To Russophobes it was confirmation of their line that Russia is a dictatorship, always has been and always will be. Russian liberals are disheartened, some to the point of despair. There are the beginnings of mockery and the re-appearance of political jokes. (Here’s bald and hairy). People like myself (I leave the classification to you, Dear Reader) are also disheartened and see The Decision as a failure of Putin’s imagination and confidence in the political system that he created. Many (probably most, in fact) Russians, however, support his return to the Presidency. And here I see several themes. A common one is that Medvedev was unsuccessful – a few are very condemnatory. They argue that he was unable to move “modernisation” forwards and failed to get much response from the West to his overtures. Another common theme is that Russia faces dangerous or difficult times ahead at home and abroad and that only Putin can be the timoneer. 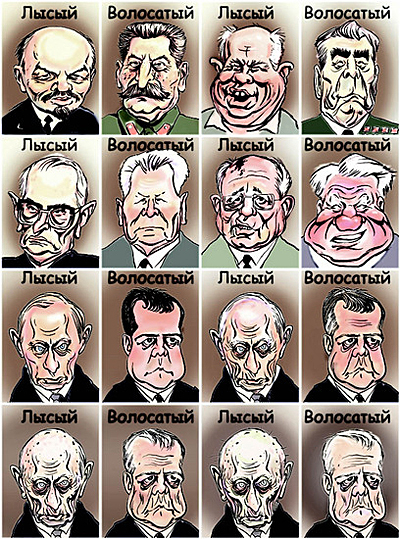 Some argue that with Putin at the top and Medvedev as PM, “modernisation” can be pushed through to the finish. Among these commentators we often see a conviction that stability and predictability take priority over everything else. And maybe that’s the clue. Russia had a pretty miserable time in the Twentieth Century and the Putin years do stand out as much better than anything then. Primum non nocere is engraved on Russian hearts. A quiet life is a lot better than the alternatives that Russia has lived, and died, through. PUTIN V.2 AND THE WORLD. While there is a measure of uncertainty in the future from Russia’s point of view – the Middle East and the future of the Eurozone are two significant concerns – some factors since 2000 have changed in Russia’s favour. Washington is no longer so confident that it is the supreme power in the world. NATO expansion is likely dead. The “coloured revolutions” were a bust: we’re unlikely to see any more. As to the sunny European future so many of Russia’s neighbours thought was waiting for them, Latvia’s recent parliamentary elections offer a pointer. Riga had two great aims in the 1990s: NATO and EU membership and it achieved both; giving it, as it thought, both security and prosperity. But it has been very hard hit in the financial downturn and it is interesting that a Russian-friendly party did best in this election. I believe that the other states that thought their best future was one in which they turned their backs on Russia will be reconsidering. And not because of the so-called Russian threat but because of disappointed hopes in the “European option”. When a Pole reads that the leader of the British Labour Party admits that the last government “got it wrong” on border controls and he realises that Miliband is talking about Poles and other East Europeans, he realises that EU membership had subtleties that he didn’t understand before. Quite apart from being on the hook to bail out Greece & Co. Thus I would expect more cooperation and less hostility from Russia’s neighbours: not Russian hegemony but the sharp bite of reality. SYRIA. This time around, having learned how NATO can expand such resolutions, Russia vetoed the UNSC resolution in Syria. It has been met with huffing and the usual attribution of ulterior motives. But it’s quite simple: Russia is a status quo power which would prefer no change because it fears it will not benefit (primum non nocere again). It doesn’t like NATO deciding national borders and who should rule them. It is sceptical of the sincerity of “humanitarian” motives. It feels it was burned by the Libya resolution which quickly morphed into a full-out overthrow of Khadafy. It wonders who’s next on the list. No so hard to predict. GAS WARS. Neither Ukraine nor Belarus can afford to pay even the present discounted gas prices and both want to re-negotiate. A Ukrainian delegation is in Moscow now and Lukashenka claims that he has won a reduction in price. Meanwhile Ukrainian prosecutors demand a 7-year jail term for former PM Tymoshenko accusing her of “abuse of office” in negotiating the current contract. Moscow will extract something for reducing the price further: it long ago gave up selling energy to its neighbours for cheap prices in return for… well, what exactly? POLITKOVSKAYA. Apparently acting on Pavlyuchenkov’s assertion that he was the organiser of the murder, Lom-Ali Gaitukayev, currently serving a jail term, has been brought to Moscow for questioning. THREATS. Those who will claim that Putin’s Russia is our enemy should bear in mind the threat assessment of the Security Council Head (and long-time FSB head) that terrorism, drugs and illegal migration are the leading threats. He observed, correctly, that these “non-traditional” threats require international cooperation. Indeed; they are most other countries’ leading threats too.